For the first time, the Baja California Culinary Fest is teaming up with culinary conference, Ensenada Gastronómica, to present a full five days of mouth-watering excitement and amazing events and tours not to be missed. Guests can pick and choose from a packed schedule of culinary outings and create their own amazing experience. From October 29 to November 2, guests will be able to explore the many flavors of Baja California, Mexico, and discover the local natural resources of the region that are being produced for the rest of the world. Chefs’ dinners, outings, tours and culinary competitions are among the exciting events planned for this once-in-a-lifetime occasion. 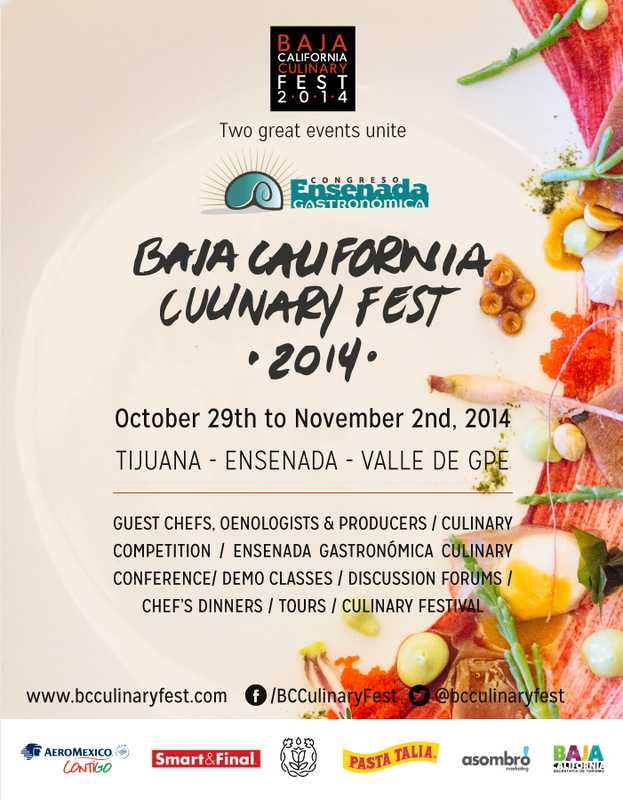 In the past, the event only took place in Tijuana, but has now expanded to Ensenada and Valle de Guadalupe for 2014. The Baja California Culinary Fest celebrates the unique tastes of Baja with all of Mexico and its neighbors to the north. This fourth-annual event will feature guest chefs, oenologists, producers and experts who will inspire culinary students, members of the press, epicureans and promoters of Mexican cuisine. The festivities kick off with “Sweet” and “Savory” competitions at Tijuana’s Culinary Institute and BCCF’s 2014 Inaugural Dinner in the colorful Mercado Hidalgo, with participating chefs as well as important personalities from Baja California. Traditional Tijuana urban cuisine will be presented, plus uniquely flavorful dishes, regional wines and craft beer. Chefs’ Dinners will be hosted on October 30 at La Esperanza Restaurant (Valle De Guadalupe) with chefs Miguel Angel Guerrero and Martín Gonzalez; and Boules Restaurant (Ensenada) featuring chefs Gerard Bellver, Zahie Tellez and Bianca Castro. On October 31, dinners will be served at Corazón de Tierra Restaurant (Valle de Guadalupe) with Diego Hernandez, Dominique Crenn and Humberto Avilés; Manzanilla Restaurant (Ensenada) featuring Benito and Solange, Bruno Oteiza and Manolo Baños; and Convivia Restaurant (Valle de Guadalupe) with chefs Flor Franco, Luis Robledo and Esteban Lluis. On November 1, Chef's Dinners take place at Malva Restaurant (Valle de Guadalupe) with chefs Roberto Alcocer, Francisco Ruano and Manuel Rubio; Misión 19 Restaurant (Tijuana) with Javier Plascencia, Ludo Lefevre, Ryan Steyn, Drew Deckman and Zahie Téllez; and Sano’s Restaurant (Ensenada) with chefs Sano Hussong and Victor Zárate. Tijuana does street food right! The Tijuana Street Food Tour with Sommelier is another event taking place that is not to be missed! On this occasion, Club Tengo Hambre will present sommelier Taylor Parsons from Los Angeles, to join their roving supper club and pair their street food menu with wines from the Guadalupe Valley. The tour includes transportation, gourmet cuisine and wine. Led by our Host Chefs at Ensenada’s Marina of the Coral y Marina Hotel, guests will work hand-in-hand with chefs to learn shellfish and outdoor grilling techniques, and how to pair them with excellent regional wines. Continuing an amazing lineup of events, on November 1, participants will get a chance to meet at the Hotel Coral y Marina in Ensenada and take part in The Ruta Del Vino Outing, where guests will visit three local wineries. The trip includes two wine tastings at each stop, plus a tour of the Museo del Vino and a country-style lunch. The last day of the festival, the Baja California Culinary Festival is offering an Aquaculture Farm Visit with a High Sea Brunch! After meeting at the Hotel Coral y Marina in Ensenada, guests will board a guided boat that will visit aquaculture farms, where hosts will explain process and production methods. The morning ends with a brunch at high sea. To close the event, all are invited to Finca Altozano for Food Trucks in the Valle, where each guest will find the best food trucks from Baja California, regional wines and craft beer, live music, hot-air balloon rides and a gourmet villa, where everyone will be able to find a sampling of all of the local natural products, and foods such as preserves, cheeses, olive oils and artisanal bread. Both the Baja California Culinary events promise a feast of opportunity to celebrate the culinary riches of the Baja region. We attended last year and had one of the most memorable experiences ever! For more information on times, locations and reservations, visit ensenadagastronomica.com and bcculinaryfest.com/es/.